ARE YOU READY FOR THE MICROCHIP? Are there plans for a microchip implant buried in the Health Care Bill? Some highly respected legal think tanks believer there is. The plan could be to microchip every child born in the USA starting in 2013. Both political parties are pushing for a Biometric National ID Card, with an RFID Chip, that will track your every move. Daniel's vision of a Revived Roman Empire is rising before our very eyes. The Mark of the Beast that the Apostle John saw in the Book of Revelation appears to be on the horizon. 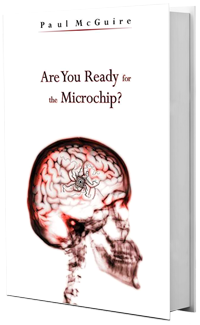 Paul exposes the truth of a global conspiracy ruled by a secret elite with deep connections to a Luciferian occult in his new book, "Are You Ready for the Microchip?"